A scientist hopes she has discovered a way to stop the spread of the Sahara Desert. Cycles of drought make the expanding desert seem unstoppable. But the journal Science published a researcher who refused to accept that. NPR's Dan Charles reports. DAN CHARLES, BYLINE: At the University of Maryland, tucked away in the back corner of the computer science building, there's a scientist who's small in stature and soft-spoken. But her ideas are big and bold. EUGENIA KALNAY: I am quite a famous scientist. I got basically all the top prizes. CHARLES: Eugenia Kalnay studies how Earth's atmosphere works. And she's had this idea for how to stop more and more of Africa from turning into desert. KALNAY: Actually, the idea came to me about 10 years ago. CHARLES: She knew there's a vicious cycle at work in the Sahara. With drought, green vegetation disappears, and the light-colored dirt that remains reflects more of the sun. And that shuts down the rising air currents that lead to rain. Kalnay thought, maybe there's a way to revive those atmospheric currents. KALNAY: It occurred to me that the same mechanism would go in the opposite way, so it will increase the precipitation and the vegetation - and then more precipitation. CHARLES: Since the problem was that light-colored dirt and sand reflecting the sun, she'd need something dark instead. But what dark thing would you want covering huge areas of the desert? Well, solar panels. Kalnay convinced one of her postdoc researchers to create a computer simulation of an otherworldly Sahara, where 20 percent of the land is covered with solar panels - also windmills. Kalnay thought they might also help the air currents. And the simulation turned out just the way she wanted. 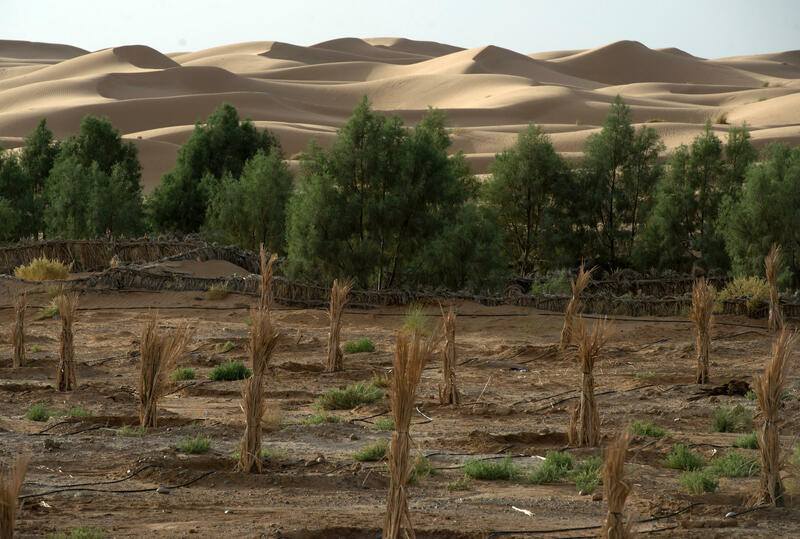 It showed rainfall increasing enough to bring back vegetation, especially along the southern edge of the Sahara, the area called the Sahel. KALNAY: It is wonderful. We were so happy because it seems like a major solution for some of the problems that we have. CHARLES: This super solar farm she imagines is huge, as big as the entire United States, generating four times as much electricity as the entire planet consumes right now. I told her it seems like science fiction. Does it seem like science fiction to you? KALNAY: I don't think so. It would be science fiction if the technology was not available. CHARLES: So you could imagine it? CHARLES: After all, she's used to imagining the workings of the entire planet's atmosphere. A few billion solar panels and windmills in the desert? No big deal.